With the advent of all this technology, there are many avenues with which to maintain proper manners without actually communicating with someone who makes you uncomfortable. Don’t want to make a phone call and actually converse with someone? Send a card. Send an e-card. Send a text. Send a Facebook message. Get my drift? My birthday was on Monday. I got nothing directly from my in-laws. They said something in passing to CJ, but that was all. And I was willing to accept that as being enough. Until today. Today is CJ’s brother-in-law’s birthday. Also a relative to my in-laws through marriage. He however, got a nice Facebook message for all to see wishing him a wonderful day and lots of love. How do they not understand that I just want their love too? The week from Hell is almost over. MJ and Q have both been sick and decided to share it with Mommy as well. It even got so bad that I asked CJ to use his last vacation day yesterday to give me some help – and a much needed nap. There was no question as far as he was concerned. CJ was glad to do it. I wonder if he truly knows just how much I appreciate him. He does so much for us. I think we make a great team. We do not have cousins who live next door who can babysit on a whim so we can go out. We do not have parents who take our kids all weekend every weekend. We work alternating shifts; give up time with each other so the kids have what they need. In our 15 minute crossover on days we both work, I give “daily report” and tell CJ when and what to give the kids for dinner before quick goodbyes and “Mommy will call you to say goodnight.” Considering everything, I think we do a pretty damn good job and it hurts me when people who are catered to try to tell me all the things I do wrong or make any other type of comment about my life. I love my family. Every day I thank God for bringing CJ into my life and blessing me with the gift of being the mother to my beautiful children. All of them. Even the little oopsie currently cooking (for a few more months). Poke me, tease me, spit in my eye; I will not let it break me. I may bleed, cry, need a hug from my babies, but your words and actions will never be more important to me than what I know to be truth. Such a wonderful man would not love me if I were such a terrible person. My children would not be smart and kind and beautiful if I were not raising them right. I deserve to be as happy as my family makes me ALL THE TIME. So I will be. Seven days ago, I gave birth to a beautiful baby girl and I am one proud mama! After MJ’s birth, I did not really suffer from Postpartum Depression. I was definitely more emotional than normal (crying at commercial, etc.) by I did not have any severe feelings. After this birth, I have an irrational fear that I cannot keep both my babies; that I will have to choose between them. I think this stems from the fact that every day since we have brought Q home, I have had to watch MJ grow more independent. He will go in his toy room alone and entertain himself without asking for someone to come in and keep him company. If I am feeding his sister before bedtime, MJ will sit alone on the sofa instead of snuggling in my lap like was our routine. I know I should be happy, but these things make me so nervous that he thinks he has been replaced and that mommy does not love him anymore – hence the fear of being able to only keep one of them. I do not know any other moms who have suffered through any type of Postpartum Depression or the like. Any advice that could be given, would be greatly appreciated. We were supposed to close on the house on Friday. I should have known better than to get my hopes up with the way our luck has been going. The only thing they needed was one last employment verification for CJ and his HR manager was unavailable yesterday. That one thing has now held us up until next week. I am told this will be the last hold up. There is nothing from this point on that could prevent closing unless CJ and I see something on our final walkthrough. To be perfectly honest, there would have to something crazy wrong for me to walk away from this now. I cannot wait for MJ to finally be able to sleep in his bed again. 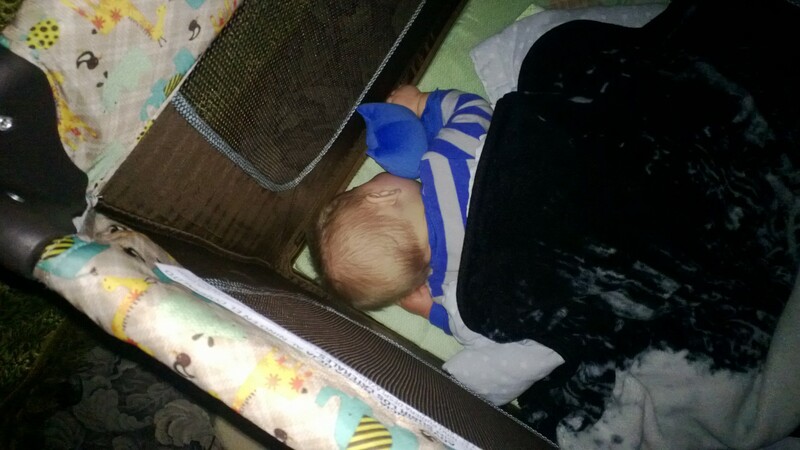 From the time he was five months old until now, he has been sleeping in a pack-and-play and I feel like the worst mother ever whenever I think about it. We were only supposed to be staying with my grandparents for a few weeks, so we did not think we would need the crib and it is buried in our storage unit. My baby deserves better. At least him and his batman do not know any better, but I still cannot wait to spoil MJ big time to make up for it.